Euan strikes first Gold of the season at the Ken Deeley open on Saturday! 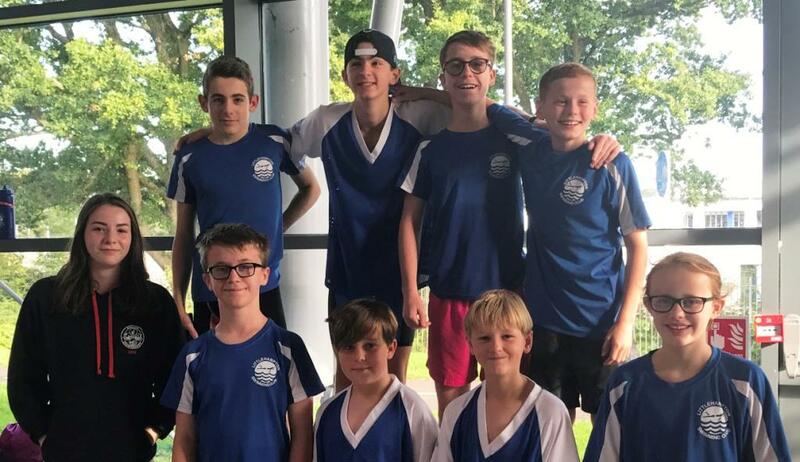 Well done to Zac Evans, Caleb Grace, Joe Greaves, Marcus Harvey, Oliver Harvey, Catriona MacLeod, Jack Mead-Pearce, Stephen Redman, Madi Walker and Max Williams who all attended yesterday’s Ken Deeley Open Meet at K2 in Crawley. Technical problems led to a very delayed start and so a very long day! 11 year old Euan won Gold in the 100 IM in a fab time of 1:15.67, a 2 second improvement on his winter county qualifying time. Euan also won Silver in the 50 free. 14 year old Madi won a fantastic 3 Silver medals (50 back, breast & free) and Bronze in the 100 IM. There were a good number of PBs too, bearing in mind the most have only been back at training for one week since the summer break! Thank you to our lovely team managers/coaches Maz Eames and Ciara MacLeod.